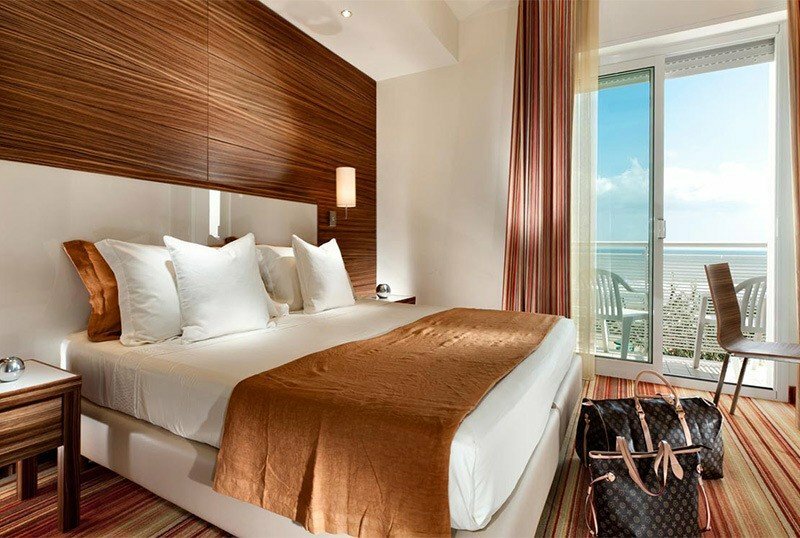 Hotel Kursaal is a 3 star Family Hotel in Riccione, located right in front of the sea. It has a swimming pool with children's area, free parking, free WI-FI and a range of services for children. Accepts small pets. The hotel is located on Riccione's cycle-pedestrian seafront, right in front of the beach. Viale Dante and Viale Ceccarini, the two central streets of Riccione full of shops and restaurants, are easily reached on foot with a short walk. The rooms are all equipped with: sommier beds, air conditioning with independent regulation, modern bathroom with hairdryer and shower, magnifying mirror, satellite TV and digital terrestrial (LCD 20 "), free WI-FI, digital safe, balcony (mainly on the sea) ) and telephone. FAMILIES: available connecting rooms and family solutions. COMFORT: different from each other for the style of furniture, the "seafront" typology has a guaranteed sea view and electric shutters. JUNIOR SUITE: they are composed of 2 separate rooms with 2 20 "LCD sat TV and have a large balcony with sea view (front or side depending on the type chosen) Includes: afternoon, water and local wine with meals, umbrella or tent with two sunbeds in addition. Garden with games corner, large swimming pool with hydromassage and baby area, free bicycles, dining room overlooking the sea, bar, reading room, renovated hall, elevator, theme nights. PARKING: available on request 3 different types of unattended parking: free subject to availability, multi-storey reserved for payment and fenced parking reserved for a fee. AIR CONDITIONING: available at no additional cost. BREAKFAST: buffet with a wide choice of sweet and savory, set up in the pool view room with outdoor terrace, with ring-shaped cake, pastries, various desserts, cold cuts and fruit. LUNCH AND DINNER: in the renovated dining room it is air conditioned with a wide panoramic view of the sea. Traditional Romagna and vegetarian cuisine, with 3 menus of sea and land and buffet of appetizers and vegetables. Pasta and desserts are homemade. VARIATIONS: choices are available suitable for vegetarians. In the hotel: indoor games room, outdoor playground area, 50 cm high swimming pool, baby / mini / junior club, strollers. Animation during meals with baby dance, tricks and art attacks is included. Also available bicycles with child seats and baby sitter and pediatrician services on request (at an extra cost). In the room: cots, side rails, bottle warmers, night lights, socket covers. At meals: possibility to anticipate meals, baby menu, baby food, high chairs, cutlery and baby place mats, afternoon snack. On the beach: fenced playground, changing table, bottle warmer. The large swimming pool has a hydromassage area and a suitably separate children's area, where the water is 50 cm deep. 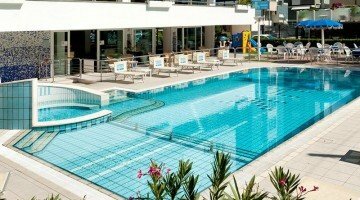 The pool is guarded by a lifeguard and surrounded by a large sunbathing area with loungers available for free. The hotel has an agreement with the beach number 100, located just in front of the hotel. It offers a playground area, table football, beach volleyball courts, beach tennis and ping-pong tables, as well as boat rental, free WI-FI, changing table, bottle warmer. Book your holiday now for a minimum of 5 days and your child's stay is FREE! From 15 May to 4 June and from 1 to 20 September, a child up to 6 years in a room with 2 adults, for a minimum stay of 5 days full board is FREE! A weekend at the beach for the April 25th bridge is ideal for spending a few days relaxing. If you intend to participate in the Judo Championships, do not miss our unmissable offer. In formula B & B starting from € 35.00 per person per day. If you intend to participate in the Judo Championships, do not miss our unmissable offer. In formula B & B starting from € 35.00 per person per day. The Fencing matches will be held at the Palazzetto dello Sport, just 900 meters from our Hotel. Discounts for groups and families.